While A New Hope was a great movie, many people consider The Empire Strikes Back to be the greatest of all of the Star War movies. It's certainly one of the greatest sequels to a great movie - it's considered to be up there with The Godfather Part II in that sense. Han Solo’s “I know” line in response to Leia’s declaration of love was a 'prepared' adlib by Harrison Ford. It’s become an iconic Star Wars quote and was also used in Jedi. When we say prepared, we mean he didn't simply make it up during filming. 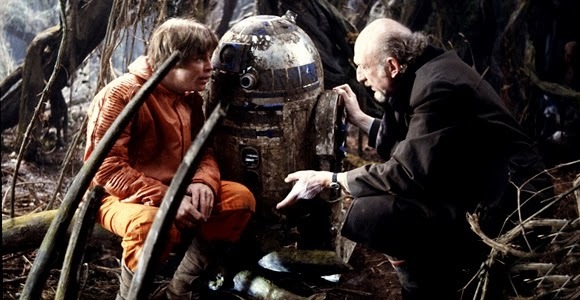 It was an off script idea put to him by Irvin Kershner which was tried and as it worked so well, used. Frank Oz who is the voice for the most famous little green guy in cinema history, Yoda was also the voice of the Muppet’s Miss Piggy. It was because of his talents that he developed with Jim Henson that saw him get the call-up. He also famously did the puppetry. In the same vein instead of the Empire finding the Rebel's hideout on Hoth, there was to be a Wampa Attack. Indeed, a cutscene that was reference in Empire's trailer featured C3PO removing a sign from a door which he hoped Imperial troops would enter and come face to face with captured Wampa. The Hoth scenes were actually shot in Norway. That dude in the Rebel Base to which Han Solo retorts, "Then I'll see you in Hell!"? just before he heads out to find a certain missing Jedi? That's Cliff Clavin from the TV sitcom Cheers and the Pixar movies AKA John Ratzenberger. In order to avoid sharing creative rights, George Lucas decided to avoid using a major film studio to finance this film. Instead, he bankrolled the $33 million production himself. And then laughed all the way to the bank to deposit all the money he made. Three characters lose bits of limbs - the Wampa that attacks Luke, C3PO when shot by the Storm Troopers on Cloud City, and of course Luke's hand to Vader's saber. If you liked that, we'v got more - check out from what animals the infamous blue milk came from or what was the original title of Return of Jedi. Here's 101 facts about Star Wars!